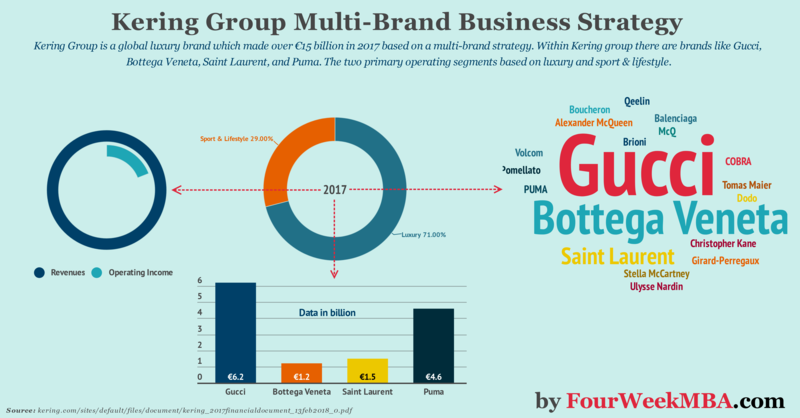 Kering Group follows a multi-brand business model strategy, where the central holding helps the brands and Houses part of its portfolio to leverage on economies of scale while creating synergies among them. At the same time, those brands are run independently. Kering is today a global luxury brand which made over €15 billion in 2017 based on this multi-brand strategy. Within Kering group there are brands like Gucci, Bottega Veneta, Saint Laurent, and Puma. The two primary operating segments based on luxury and sport & lifestyle. When you look under the hood of the Kering group, one of the most striking things is the variety of luxury brands it holds. In fact, throughout the years Kering has developed a business model strategy of aggregating several brands under the same corporate umbrella. However, each of those brands is managed independently. That allows the company to be diversified, while at the same time guaranteeing the operations to be agile (via the separately managed brands) and to take advantage of synergies between those brands. Another critical aspect is that the business model of the group is it family-owned structure, which guarantees a fast decision-making process. Therefore, the change of direction can be steered quickly. Indeed, Kering didn’t start as a luxury company at all. Its beginnings were related to lumber trading. Only in 1994 Kering started to reposition its brand. This repositioning culminated with the war to acquire Gucci. After that Kering consolidated its position in the Luxury brand industry, by buying several other fashion luxury brands. This process is still ongoing; even though Kering is among the largest luxury holdings in the world. Brands like Gucci, Bottega Veneta, Saint Laurent, Alexander McQueen, Balenciaga, Brioni, Christopher Kane, McQ, Stella McCartney, Tomas Maier, Boucheron, Dodo, Girard-Perregaux, Pomellato, Qeelin and Ulysse Nardin are part of the Kering galaxy. Kering also develops Sport & Lifestyle brands PUMA, COBRA, and Volcom. This multi-brand approach similar to that of LVMH allows them to be independent also at the creative level. This decentralized model attempts at fostering rapid growth for those brands. The logic is to enable agility, balance, and responsibility across those Houses. Indeed, while each of them keeps its identity expressed in their unique characters, the Group provides the infrastructure to support the operations of those brands, while allowing them to scale up via distribution networks that leverage on the Group economies of scale. Also, the Group acts as the mediator that encourages the brands to form synergies with each other and share best practices to drive innovation. Another critical aspect is Kering vertical integration. Just like Luxottica vertical integration strategy since 2013, the Group strengthened its upstream positioning in the Luxury Goods value chain. For instance, the group purchased leather tanneries to secure raw materials sourcing. Also, logistics activities for Couture & Leather Goods brands have been centralized. Why do companies choose vertical integration even when it implies a significant capital investment? Vertical integration allows to achieve more control over the whole process; it also helps the company to keep high-quality standards. At the same time, it will enable an organization to maintain control over those processes. So in one word, one of the main reason for vertical integration is control! The vertical integration and multi-brand strategy are reflected in Kering organizational chart. On the one hand, the holding controls the major geographical areas. Kering Corporate controls two main segments: Luxury activities and Sport and lifestyle activities. In 2017 the companies made over fifteen billion euros in revenues for the overall group, a twenty-five percent growth compared to 2016. It also improved its operating income by nineteen percent, while decreased its net debt by over thirty percent. Who’s going to be the next brand to add to the multi-brand strategy of Kering?